The hospitality I met most places was really a joy.. so welcoming and helpful people, but still not pushing. Most of the time I didn’t at all feel alone as most people are very curious about what you’re up to, especially when you are “solotripp’n” I believe, and as a solo traveller you will pretty soon connect with other solo travellers from all over the world – awesome! 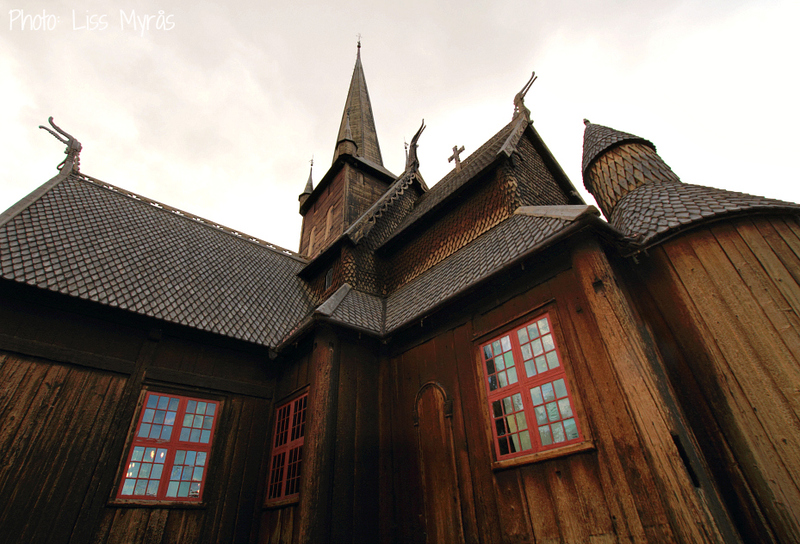 After a massive burger & fries dinner together with a chilled cider I decided to take an evening walk to check out the famous Lom Stave Church for some historical inspiration and design admiration – dated back to the 12th century! 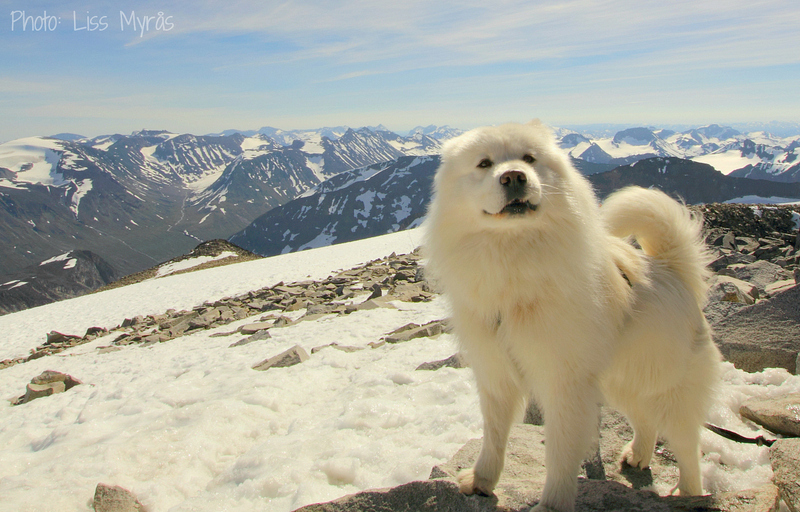 The very next day I actually had a lil’ plan – to climb Galdhøpiggen – the roof of Norway also the highest mountain in Scandinavia and Northern Europe at a hight of 2,469 m (8,100 ft) – we just call it Piggen in Norwegian. The rising sun was promising and the morning bus brought a nice bunch of mountain hikers & climbers up the serpentine road and into the Jotunheimen National Park. 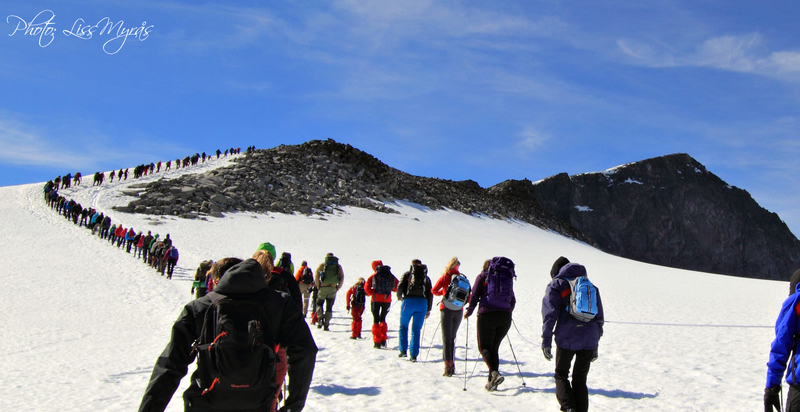 Since we had to cross the glacier Styggebreen we needed harness and safety ropes, but otherwise this is a not a hard climb and suites most healthy people,families .. and dogs. 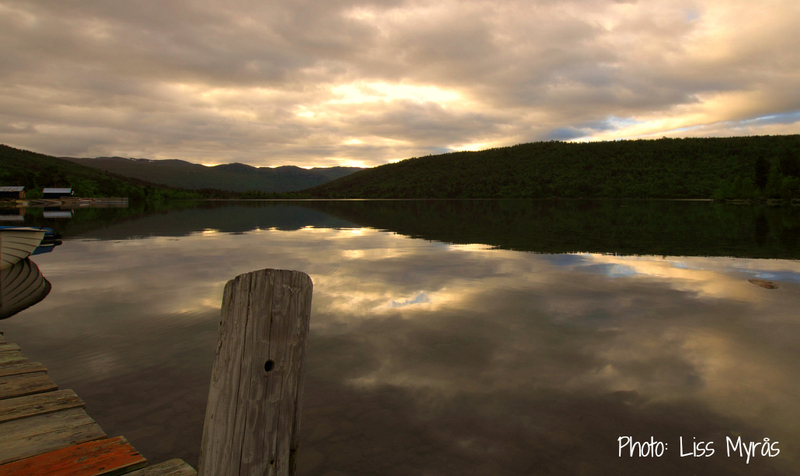 This day was 1 of only 5 sunny days on Piggen during the whole summer a guy told us – so we where lucky! 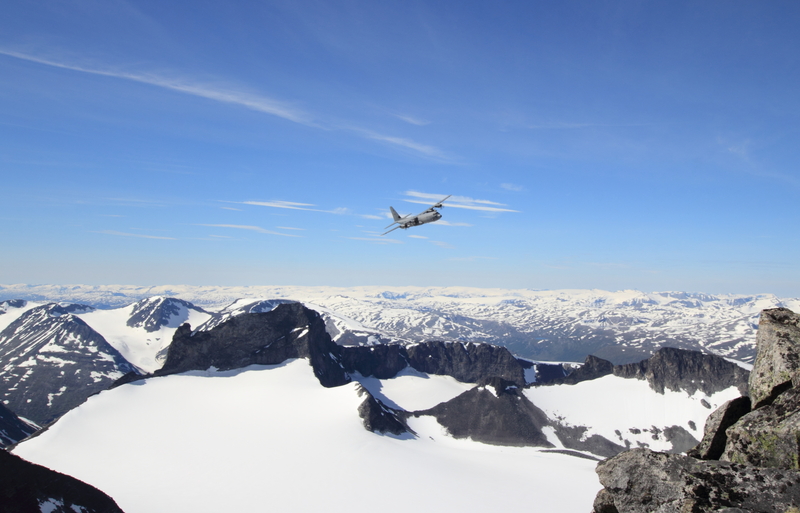 The Norwegian army paid us a flyby-visit at the top of Galdhøpiggen with one of their hercules ..to celebrate an awesome day. Many of us screamed when the air plane passed, it sure did look like it would crash right into the top hut ..ha…ha whohaaa! Back at the Juvasshytta we where a little bunch of very pleased people just sitting outside relaxing in the wonderful weather with some hot chocolate and candy, waiting for the experienced and kind bus driver to take us back down. I only have one important reminder/advice for days like this..to save you a lot of pain: PLEASE …bring your highest sun protection! Morning glory trek somewhere in Skjåk before hitting the road …. Now and then (especially if you’re bike touring) you want to rent a cabin to rearrange, fix and dry all your stuff (clothes, tent, sleeping bag, shoes etc) – mention that you travel alone and you may get a discount, very appreciated since renting cabins in Norway usually isn`t a cheap experience. Billingen Seterpensjonat in Skjåk will serve you local produced products, breakfast and room. Also a gate to Breheimen Nasjonalpark, Reinheimen Nasjonalpark and the “Diktarstigen” where you can trek along the Tora river and read poems by Jan Magne Bruheim. View their Facebook-page. 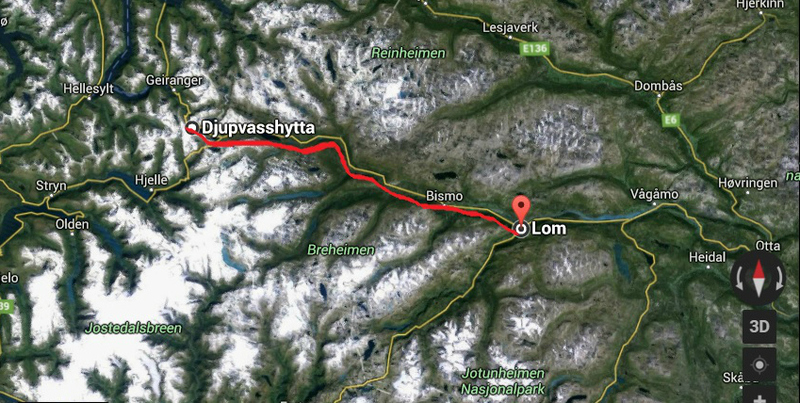 Make sure you spend enough time in the Lom (preferably at a decent price at one of the camping sites or Bøverdalen hostel if you’re on budget like me). 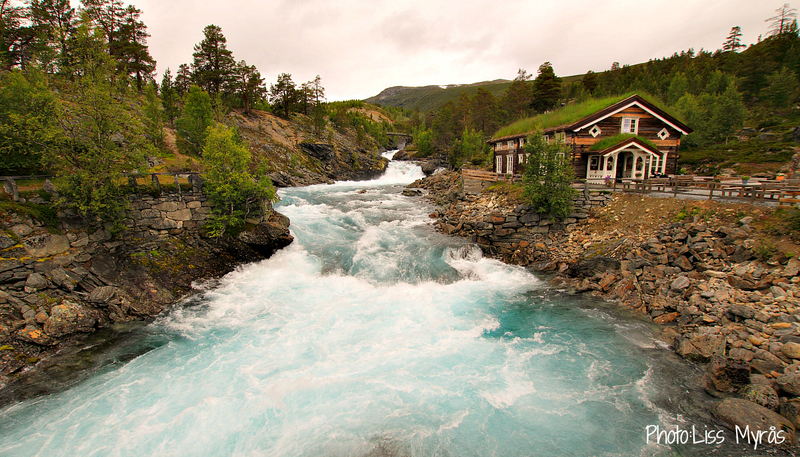 There is so much to do in this area both for sports and mountain lovers or nature seekers that 2 days are far from enough…try out zip-lining across Prestefossen, climb a bunch of 2000-meter mountains, go into the ice world at the Climate Park (Klimaparken) or visit Norsk Fjellmusem.